The Art of Painting, An Allegory: Jan Vermeer: Analysis of "The Artist in His Studio"
For the meaning of other pictures, see: Famous Paintings Analyzed. The Art of Painting (in Dutch: De Schilderkonst), also known as The Artist in His Studio and The Allegory of Painting, is a celebrated genre painting by the Delft painter Johannes (Jan) Vermeer. The largest example of Vermeer's style of Dutch Realism, it is believed to be a full-blown allegory - commenting on the art of painting and the artist's role in society - and maybe even a self-portrait of himself in action: hence the work's various titles. In November 1940, it was purchased personally by the Nazi leader Adolf Hitler from its owner Count Jaromir Czernin for a price of 1.65 million Reichsmarks. After the war it was seized by the Americans who handed it over to the Austrian government. It now resides in the Kunsthistorisches Museum, Vienna. The picture is believed to have been Vermeer's favourite, which is rather surprising. True, it remains a typical illustration of his Dutch Baroque painting, but it hardly ranks as one of his masterpieces - a view supported by the fact that for many years it was thought to have been painted by Vermeer's Delft contemporary Pieter de Hooch (1629-84). This canvas is one of the two allegorical-literary works by the artist - the other being Allegory of Faith (c.1673, Metropolitan Museum of Art, New York) - which have come down to us, and it would seem, given Vermeer's working methods, that it was the genre he was least suited to. Although it embodies certain of Vermeer's ideas about the art of painting, this canvas hardly represents either the artist himself or his working methods. Even so, it must have possessed some unusual significance for Vermeer, who kept the painting until his death. Vermeer's finest works are his interiors with a single female subject. They include: The Milkmaid (c.1658, Rijksmuseum, Amsterdam), Young Woman with a Water Jug/Pitcher (c.1662, Metropolitan Museum of Art, New York), Woman Holding a Balance: aka The Goldweigher, (c.1662, National Gallery of Art, Washington DC), Woman with a Pearl Necklace (c.1662, Staatliche Museum, Berlin), Girl with a Red Hat (c.1666, National Gallery of Art, Washington DC and The Lacemaker (c.1669, Louvre, Paris). The picture - at roughly 4 feet by 3 feet, his largest - is either an allegory or (perhaps more likely) a celebration of the art of painting. Either way, the scene's 'theatrical' quality is deliberately highlighted by the prominent curtain which is pulled back to the left as if revealing a stage play. Looking beyond the parted curtain, there is a brightly lit studio in which a model is being painted by the artist who sits with his back to the viewer. The room is far more elegant than a regular artist's workshop, with a gold chandelier, fine furnishings, expensive marble floor tiles, and so on. To Vermeer's contemporaries, the artist's model would have been instantly recognizable from her dress as the muse Clio, one of the nine personifications of the highest standards of art and philosophy in Greek mythology, who became the patron of History. She is rendered exactly as described by Cesare Ripa in one of the most popular books on the emblems and personifications of artistic subject matter ever written, the Iconologia. The Dutch translation of this important Italian work, by Dirck Pietersz Pers, first appeared in 1644, and Vermeer, if he did not own a copy, must have known the book well. Clio is depicted wearing a laurel crown and carries a book by Thucydides and a trumpet (depicting fame). The painter himself is wearing an obviously old-fashioned, historical outfit. The message is that painting is on a par with other arts like poetry and philosophy, and - more importantly - that painting can represent any visual manifestation, real or imagined, in the history of the world. In particular, the picture itself demonstrates, through the use of linear perspective and chiaroscuro, that painting can fool the eye into "seeing" three-dimensional depth and solidity of form. All this was Vermeer's attempt to answer one recurrent question that continued to be debated by painters, sculptors and writers - What was the painter's place in society? Was he a craftsman, on a level with carpenters, masons and goldsmiths, or a creative thinker on a par with poets, architects, engineers and philosophers? 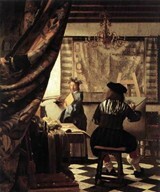 Vermeer's answer, like that of other Dutch Realist artists - notably the brilliant interiors artist Samuel van Hoogstraten (1627-78) - was that painting was the equal of any other art, since it was capable of representing all possible visual ideas, and deluding the eye with illusions of depth and colour. Adorning the gold chandelier is a double headed eagle, the official symbol of the Austrian Habsburg dynasty, former rulers of Holland. Thus experts believe that the chandelier represents Catholicism, while the lack of candles is a reference to its suppression by the dominant Protestant faith. In any event, like the hat worn by an Orthodox Jew as a reminder of the existence of a higher power, the chandelier is an allusion to the overarching presence of God. The map covering the rear wall of the studio contains a tear symbolizing the division between the Dutch Republic to the north and the Habsburg-ruled Flemish provinces to the south (note: as was the custom, the top of the map points to the West). As a whole, the map serves as an illustration of how far a painter's fame could spread - from Antwerp to Amsterdam, through all the schools of Dutch Realist painting including Utrecht, Haarlem, Leiden, Dordrecht and Delft. The remainder of the studio's plush furnishings and fittings merely symbolize the material prosperity which is within the reach of talented painters. Colour played an important part in all Vermeer's paintings, and he had a particular weakness for the cool blue hue of natural ultramarine, made from the mineral Lapis Lazuli. This was (and still is) one of the world's most expensive colour pigments. How he managed to finance his generous use of ultramarine - even after the disastrous year of 1672 - remains something of a mystery. One answer is that he was supplied with materials by a collector, possibly Pieter van Ruijven, whose son-in-law Jacob Dissius held a major auction of 21 Vermeers in Amsterdam in 1696.  For more about 17th century Dutch 'interior' genre painting, see our main index: Homepage.